Mobile boarding pass on iOS supported now? I was told that the mobile boarding pass on iOS is only available to domestic flights. 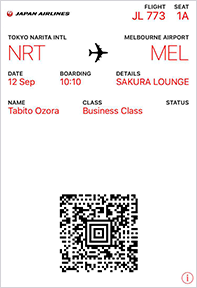 Can anyone confirm that if the JAL mobile boarding pass is now available to all flights? I received a mobile boarding pass compatible with the iOS Wallet app for HND-SFO yesterday. So availability is not limited to just NRT. Thanks for the reply! Did you get the boarding pass thru the "not so user-friendly" app? There is a new app which is totally user friendly. Mobile boarding passes are not available from the US, though. And I couldn't get them for my domestic flights despite the move to Amadeus. No, I checked in on the website (checkin.si.amadeus.net) and it gave me a downloadable file which opened in passbook.